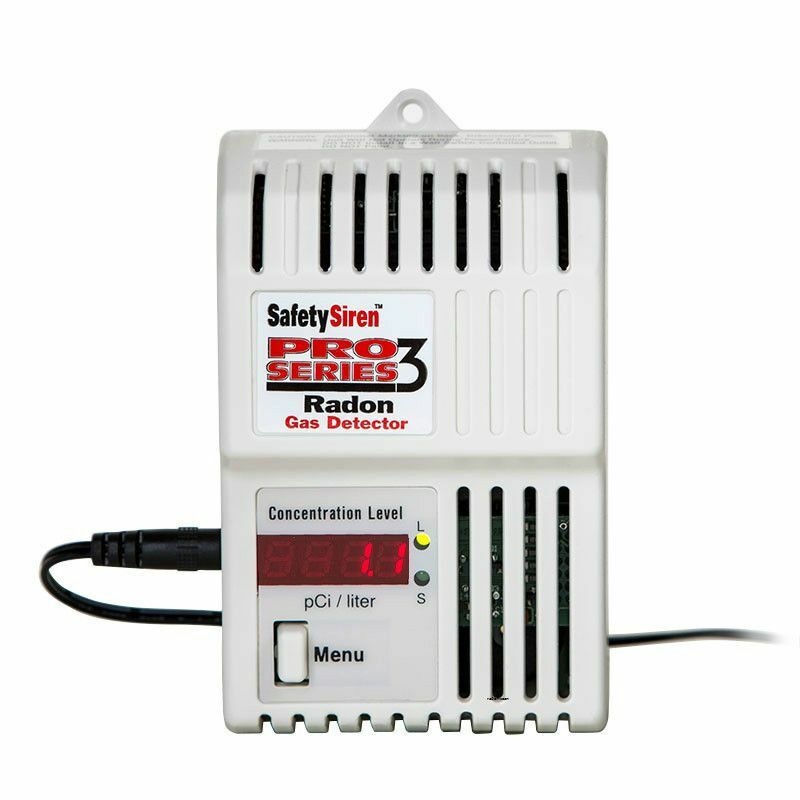 The Pro Series 3 Electronic Radon Gas Detector is designed for use by the homeowner. The detector allows the homeowner to monitor the radon level in their home with an easy-to-read digital display. Radon is a radioactive gas that is colourless, odourless, and tasteless and is impossible to detect without the use of sensitive test equipment. Radon gas rises through the soil and seep through cracks, holes and drain pipes in the foundation or basement. Radon is a naturally occurring gas produced by the breakdown of uranium in soil, rock, and water. When allowed to accumulate to high levels, it can be hazardous to long-term health. Radon is the second cause of lung cancer after cigarette smoking. The EPA presently suggests that corrective action be taken to reduce the radon levels in your home if measured over the long term at 4 pCi/L or greater in the USA. Health Canada has established the acceptable levels of radon in the house not to exceed 200 Bq/m. 1 year warranty against defects in materials and workmanship under normal use. Pro Series 3 Gas Radon Detector The Pro Series 3 Electronic Radon Gas Detector is designed for use by the homeowner. The detector allows the homeowner to monitor the radon level in their home with an easy-to-read digital display. Radon is a radioactive gas that is colourless, odourless, and tasteless and is impossible to detect without the use of sensitive test equipment. Radon gas rises through the soil and seep through cracks, holes and drain pipes in the foundation or basement. Radon is a naturally occurring gas produced by the breakdown of uranium in soil, rock, and water. When allowed to accumulate to high levels, it can be hazardous to long-term health. Radon is the second cause of lung cancer after cigarette smoking. The EPA presently suggests that corrective action be taken to reduce the radon levels in your home if measured over the long term at 4 pCi/L or greater in the USA. Health Canada has established the acceptable levels of radon in the house not to exceed 200 Bq/m. Pro Series 3 Gas Radon Detector is rated 4.6 out of 5 by 7. Rated 5 out of 5 by Cheryl from User friendly. Quick readings, easy to use and like the fact that it is portable to more than one location. Rated 5 out of 5 by Gman from Works great This seems to work great it's been giving me a good piece of Mind knowing that I have low radon levels. I recently went to a renovation show and found out that the pros use these as well for the testing homes. Rated 4 out of 5 by Ronie from Easy to operate All you need is to plug it in. Regular sampling is illustrated to show level of radon. Alarm will sound if excessive. No sampling and mailing off to testing laboratory with it’s wait. Rated 4 out of 5 by stickery from clear read out I haven't yet taken the time to study exactly what the read out means. Rated 5 out of 5 by robin from Good Product. Bought this in Calgary as recent studies here show parts of Calgary had very high readings. This product is no nonsense plug and play. Just plug into outlet and wait a few days for a reading. It takes a few days for it to establish a long term reading of your house. Recommend it. Rated 4 out of 5 by Alex from Quick response and regular monitoring It can be a bit fiddly, but I'm glad I bought it. It gives a day to day reading of the radon in our basement, making us feel safer about the levels. When it goes above the safe level, it emits a loud beep that can be heard pretty much anywhere in the house. I would definitely recommend it. Is this radon detector an approved product? It doesn't say in the specifications.